This very successful 30 year old facility in Langley was showing signs of structural corrosion of the main roof steel support columns at the splash zone above and around the pool surround level. 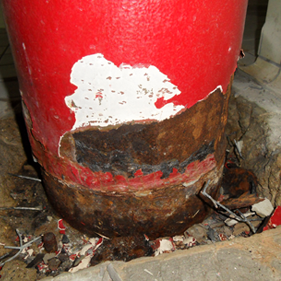 Investigation by Jenkins and Potter revealed that significant loss in section had resulted from the corrosion and that strengthening works were required. Stress UK were asked to design a strengthening solution using carbon fibre wrap. All works were completed ‘out of hours’ during the night in order to allow the pool to continue operating. 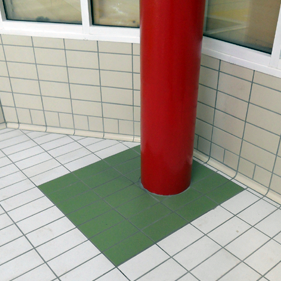 Special protective measures were taken to prevent migration of dust and debris into the pool. 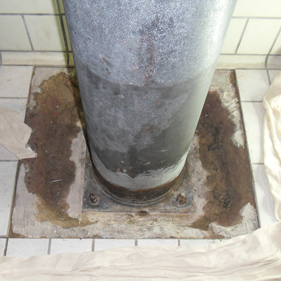 The lower sections of the affected CHS columns were stripped of all coatings, the surface prepared to SA2.5, then drilled and filled with high strength mortar. The exposed sections of the columns were then wrapped in layers of carbon fibre sheet from 0.55m above the tile level down onto the base plates. 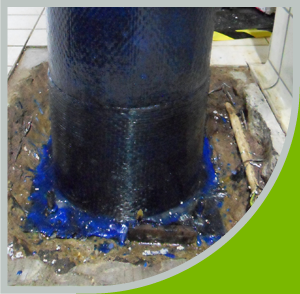 The excavations into the structural slab to expose the base plates were backfilled with high strength concrete, the columns were recoated with intumescent paint and an epoxy top coat. The tiling was then repaired and grouted. The steel work has suffered in the damp, humid atmosphere of the swimming pool area causing extensive structural corrosion to the roof supports. The columns were stripped of all coatings, prepped then filled with high strength mortar. The exposed columns received a carbon fibre wrap to protect and strengthen. Our team carefully reinstated the area around the repair to a high level without disrupting use of the public facility.